My husband is very good at surprising me, only it’s not always the kind of surprise you want! Husband: “I did tell you that we have been invited to Michael’s for a bbq tonight didn’t I?” – errr No! Quickly I ran through in my head what I had in the fridge and cupboard and thought how I am going to pull something together in the few minutes I have??? Here is what I made and it was a winner – loved by all! Note – this is a long list of ingredients but you don’t need to add everything. Just use what you have. 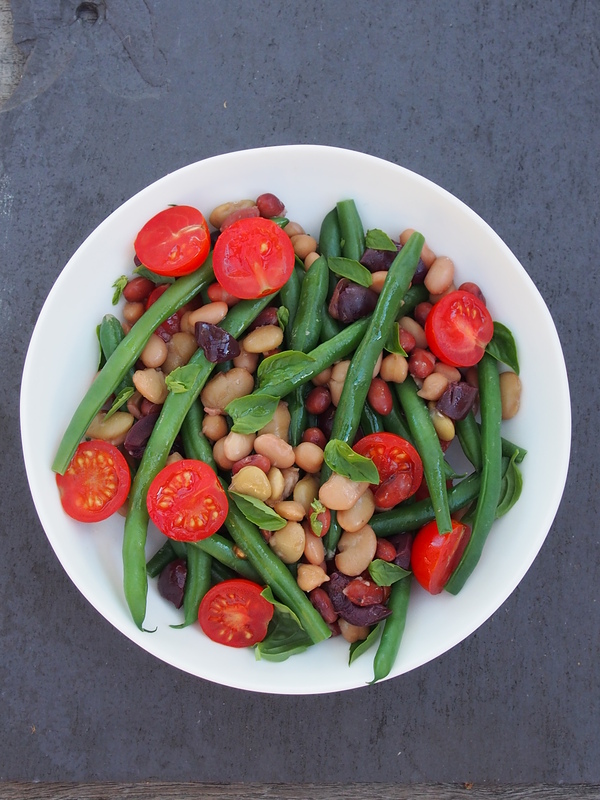 The base of bean mix, olives, cherry tomatoes, basil and baby spinach leaves is enough. Then add whatever other ingredients you feel like. Start by draining and rinsing the tin of 4 or 5 bean mix - set aside. Then make the dressing: Put olive oil, both vinegars and garlic into a jar with a tight fitting lid and shake well. 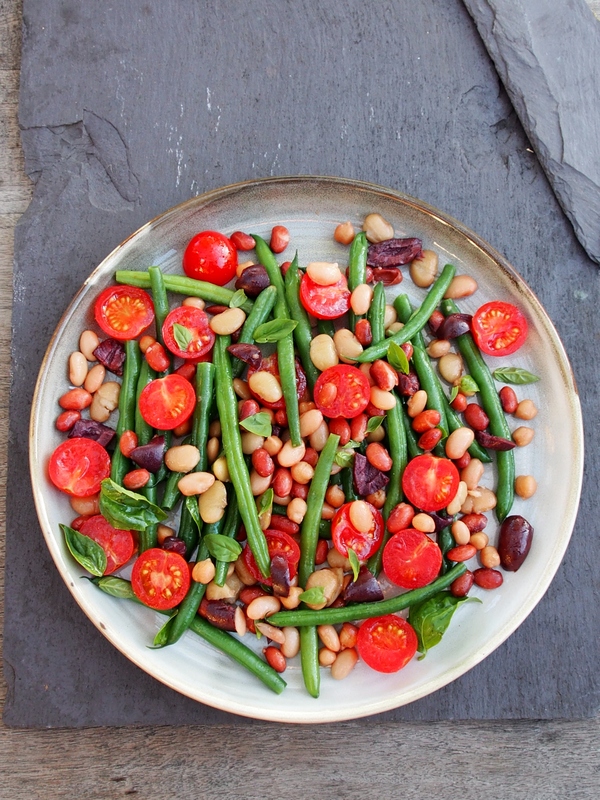 Pour dressing over tinned beans and allow to marinade while finishing the rest of the salad. When beans are cooked, refresh under cold water and add the asparagus to the steamer for 3 minutes. Again refresh under cold water when cooked. While beans and asparagus are cooking, slice capsicum into chunks, artichokes in half and add to a large bowl along with olives, cherry tomatoes and basil. 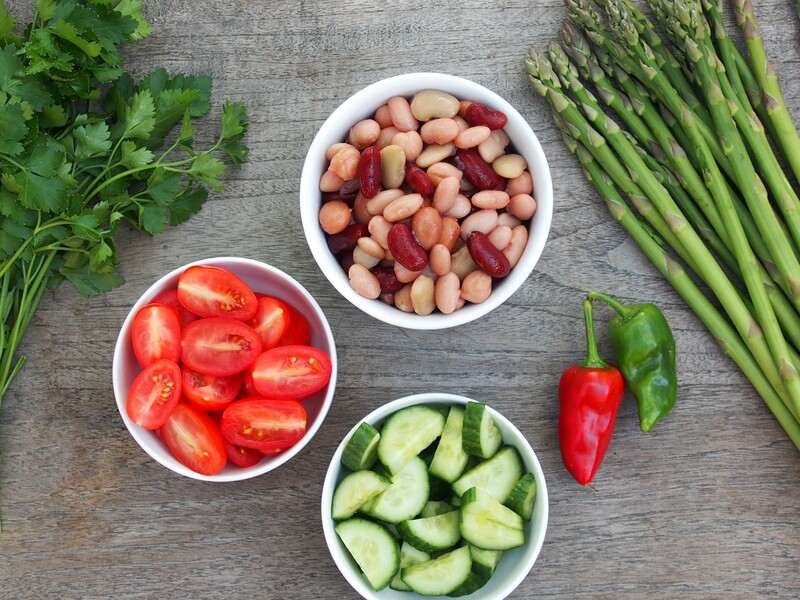 Add marinated beans to large bowl and toss through, then gently add beans and asparagus and mix in. 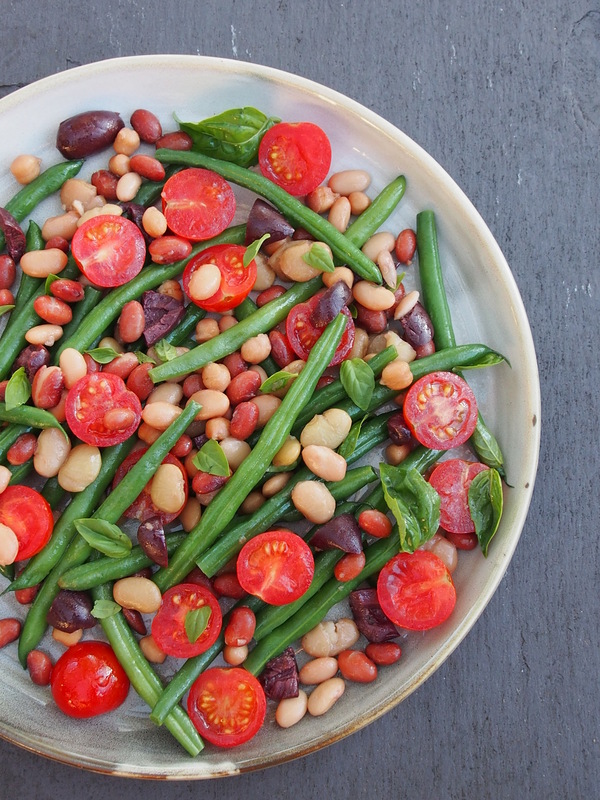 Place baby spinach leaves in the bottom of a serving bowl and tip bean salad on top. Note: Leftovers the next day tasted even better….see photo below served with some extra lettuce, baby beetroot and my new favourite sprouted bread toasted and topped with a drizzle of extra virgin olive oil, smashed avocado and fetta…YUM!!! Hi Caroline. This looks yummy will have to give it a try. Is the sprouted bread gluten free? Hi Barbara – Sorry, no, the sprouted bread contains wheat, but please do give the salad a go as it is very yummy! Caroline where did you find the sprouted bread? I’ve heard about it a lot but haven’t been able to find any as yet. Hi Maja – I found it at Healthy Life in Marrickville Metro, 7 star supermarket on King St Newtown, which is just near Bloodwood (great restaurant) and at Alfalfa House in Enmore. It really is worth it. Cut with a wet knife, toast it and drizzle with a really good olive oil….delicious! !